Articles > Heated Brush Adds Volume! 1. 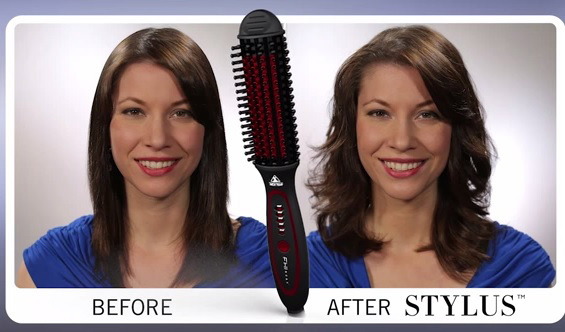 If she has a strong cowlick in the fringe area, simply brush the hair left, then right using the Stylus™. This allows the cowlick to lie in a more natural position. Then brush the fringe back in a c-shaped motion. 2. To get lift at the root, take a section of hair, give the Stylus™ a little turn, let it rest for a few moments, then lift up and brush all the way through. 3. To create volume and body through the sides, take the Stylus™ and brush through the hair as you twist the Stylus™. When you get to the ends, give the Stylus™ a little twist and the hair will fall naturally out of the brush. 4. Take the next section, brush through the hair to detangle before placing the Stylus™ underneath the hair, give a slight rotation and twist as you glide through. Continue until all of the hair has been styled.